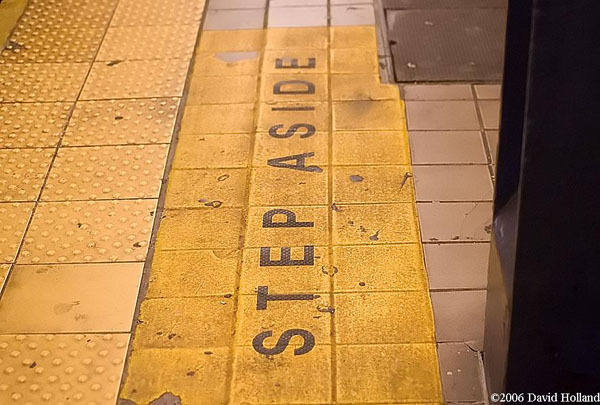 A direction many have to follow on the usually crowded uptown 51st Street platform. Resized photo courtesy of Eye On Transit. The three Lexington Avenue subway lines — the Nos. 4, 5 and 6 — have gotten so crowded that riders are routinely stranded on the platforms during peak periods, unable to board the cars, according to a report released on Wednesday by the office of City Councilman Daniel R. Garodnick, who represents parts of the Upper East Side. The problem is not new, but Mr. Garodnick said it was probably worse on the East Side lines than anywhere else in the system, citing the passenger-loading guidelines used by New York City Transit, the arm of the Metropolitan Transportation Authority that runs the subways and buses. Mr. Garodnick urged the authority to spare the three lines from the service reductions being contemplated as the authority struggles to close a growing budget deficit. Even at full capacity — 27 trains per hour — during the morning rush, the two Lexington Avenue express lines, the Nos. 4 and 5, frequently are too full to accommodate all the passengers, who must wait for the next train. Transit guidelines call for a three-square-foot space for each passenger to stand; often, such space is unavailable. The result, Mr. Garodnick said, is not only commuter frustration, but also lost economic activity, and safety concerns. Although the evidence from the report is more suggestive than scientific, the findings suggested heavy crowding. * More than 130 riders were kept off of each downtown No. 6 train at 77th Street during the morning rush, defined as 8:15 to 9 a.m. On two days, the number of stranded passengers exceeded 400. * At least 75 commuters were unable to board each No. 4 and 5 train at 59th Street on the nights of Yankees home games in August. * During the two commuter rush periods, an average of 25 riders were left stranded by every train at the stations observed. Well the report issued reveals nothing that millions of riders didn’t already know. However the MTA is not lying when they say that they have maxed out capacity on the corridor. Under the current conditions it would be impossible to add anymore trains. If anything this report just further illustrates why we need a properly setup Second Avenue Subway. What I mean by properly setup is in terms of actual stops & service patterns. The goal of the SAS should be to encourage riders to use it & you can only do that by providing service that matches the needs of riders. Unfortunately the SAS is over budget & nowhere near being ready to be what it can & needs to be. So for now, riders of the Lexington Avenue subway corridor will continue to suffer.